As the London government struggles with its own incompetence and internal divisions, the prospect looms larger of a sudden implementation of security, immigration, customs and regulatory controls, and a likely return of physical and military-style installations along the border. Talks between the British Prime Minister Theresa May and opposition Labour leader Jeremy Corbyn to negotiate a last-minute pact to win a majority for a withdrawal deal failed to make any headway this week. Mrs May has now sought a second extension to Brexit day, to June 30, but without a tangible change in circumstances this could well be refused by the EU leaders, who meet on Wednesday. Speaking at a press event in Dublin today, Taoiseach Leo Varadkar has said that he expects the London government to introduce customs checks only at airports and sea ports, in line with its previous commitments. 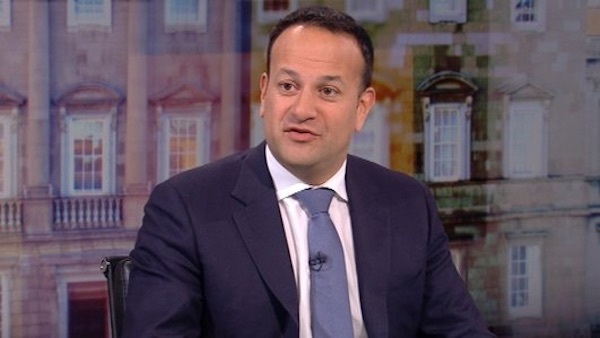 Speaking on RTÉ’s Countrywide programme, Mr Varadkar said: “Even in the event of no-deal, we will still be saying to the British that you still have obligations under the Good Friday Agreement. The backstop is the policy agreed in December 2017 which is supposed to guarantee that the border remains “frictionless”, regardless of the outcome of Brexit negotiations. Mr Varadkar said the logical way to ensure a free-flowing border would be for regulatory checks to take place between Britain and the north of Ireland at the ports in Belfast and Larne. Mr Varadkar believes Britain will treat the Six Counties ‘differently’ as previous announcements by London said there would be no tariffs on goods remaining on the island of Ireland. He claimed any arrangements which follow on from a crash Brexit would be temporary. He added: “The UK has already suggested in its no deal planning that it would treat Northern Ireland differently from Great Britain and that opens up the potential to have checks at Larne and Belfast which is the logical place to have them of course and not on the land border,” he explained. Sinn Féin President Mary Lou McDonald has said that the rights of citizens’ in the North must be protected alongside the Good Friday Agreement. “From the beginning of this whole Brexit escapade we have made it clear that the view and democratic mandate of the people of the North of Ireland must be respected,” she said.